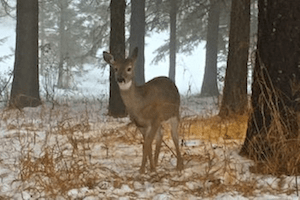 We send you warm season’s greetings from everyone at the Abbey, including Trinley the deer and all the turkeys. We had several snowstorms in December—silent, magical sights that give us exercise in snow shoveling the next day. The Abbey is beautiful in the winter and the lack of forest and garden work gives us more time for inside work. This year we are busy preparing for the Living Vinaya in the West program that runs January 22 to February 8. We will host Ven. 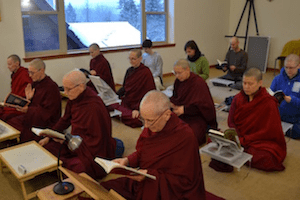 Master Wu Yin and her disciples from the Luminary Temple’s bhiksuni sangha as the faculty, and nuns from all Buddhist traditions as participants. Including the Abbey sangha, there will be 45-50 people staying at the Abbey proper. Volunteers will live at the newly refurbished house at Tara’s Refuge down the hill. If you would like to participate, volunteer, or support this course, learn more on our website and get in touch with the Abbey. We hope you enjoy the short video slideshow of the Abbey’s 2017 highlights. All the Abbey life photos are here. Wishing you and all beings a peaceful 2018. At Luminary Mountain Temple in Taipei, Ven. Chodron and Ven. Damcho met with Ven. Master Wu Yin and visited the temple’s social welfare projects that address rural poverty in the neighboring Meihua community. It was inspiring to see the results of the Luminary nuns’ collaboration with the community, including using children’s artwork to rejuvenate a school that was about to close down, and starting a bakery that reuses soybean dregs to make tasty pastries. Ven. Chodron also gave a series of Bodhisattva’s Breakfast Corner talks at the temple, which will be translated into Mandarin and posted on Luminary Temple’s Youtube channel in the Spring. The nuns then traveled to Kuala Lumpur, Malaysia, where Ven. 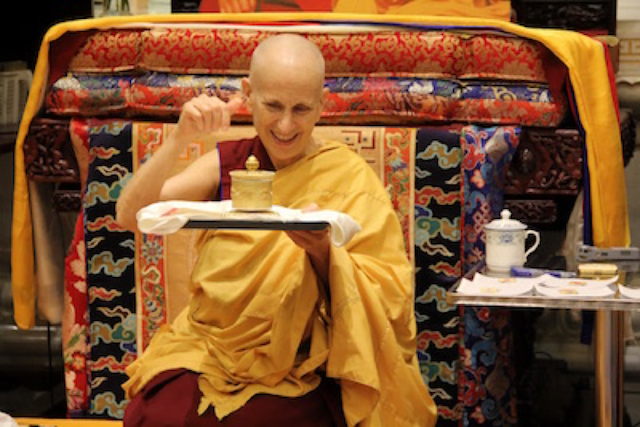 Chodron led a retreat on the “Four Thoughts that Turn the Mind to the Dharma” at Buddhist Gem Fellowship (BGF). She first taught at BGF in 1988 and was delighted to meet old friends, witness the expansion of the BGF, and stay at their new premises. Listen to the teachings here. Ven. Chodron also gave public talks at Nalanda Buddhist Society in Kuala Lumpur, a group she first visited in 2008. They, too, had grown by leaps and bounds in membership and had expanded their premises. There, she connected with old friends who shared photos from 1988, and rejoiced that they were all still connected in the Dharma. Listen to the three talks here, here, and here. 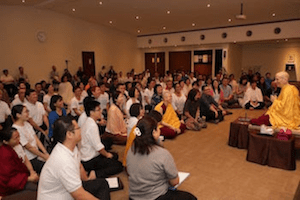 Both groups in Kuala Lumpur practice in the Theravada tradition, and the Abbey nuns appreciated the exchange of ideas and the ability to practice together simply as Buddhists. In all the temples and centers the venerables visited on their trip, they learned about statues and construction of meditation spaces in anticipation of the Abbey building a new temple/meditation hall/library in the future. In Penang, Malaysia, Ven. Chodron gave two public talks and led a weekend retreat on “Good Karma.” The organizers weren’t sure that there would be interest in English-language Dharma talks—they had mostly organized Chinese-language events before. They were very surprised and happy when well over 110 people turned out for each public talk and 60 people for the retreat. Malaysia photos are here. The venerables were also able to visit several monasteries and get to know their abbesses and abbots. In Taiwan they were warmly welcomed at Pu Yi Yuan, Luminary Mountain Temple, and Miao De Aranya, and met with the abbesses of these monasteries. 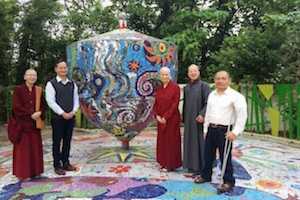 In Penang, Malaysia they met with the abbot of Kek Lok Si, the largest temple in the country, as well as the abbot of Than Hsiang Temple. And in Singapore, they had lunch with the abbess of Pao Kwan Foh Tang Nunnery and tea with the abbess of Pu Ti Buddhist Temple. If you’re interested in what nuns talk about when they get together, it ranges from socially engaged Buddhism, to how to train disciples, to chanting melodies. The schedule in Singapore was jam-packed with one or two talks daily, plus meeting with many friends and students who have stayed in touch with Ven. Chodron since she lived there from 1987-88. Friends of Sravasti Abbey Singapore (FOSAS) played a huge role in supporting the talks, which were held at diverse temples and Dharma centers. Pureland Marketing graciously hosted the nuns for the 12 days they were in Singapore. 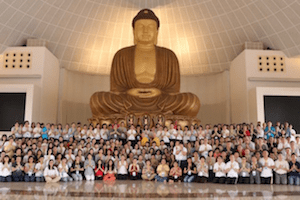 Attendance at the talks was excellent, with over 700 people attending the talk on “Connecting with Amitabha” and about 300 people attending a day-long course on mindfulness, both held at Kong Meng San Phor Kark See Monastery. Listen to the talk on the Amitabha practice here and on distinguishing between Buddhist and secular mindfulness here. 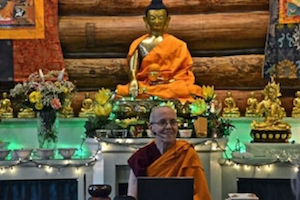 Watch a talk on nirvana given at Buddhist Library here and a talk on Buddhist logic given at Tibetan Buddhist Centre here. All other talks in Penang and Singapore will be posted on the web soon. Having completed their two-year novice training, Ven. Losang and Ven. Pende traveled to Taiwan to receive full ordination in the one-month, Triple Platform Ordination ceremony held at Three Jewels Mountain Ling Yan Chan Monastery. They both practiced well to have this opportunity and worked hard at the program, despite the challenges of being in another country and not knowing the language. Both Abbey monastics were very grateful for all the kind help they received from the Chinese sangha, who took good care of them. They were also able to visit some of the monasteries that the Abbey has warm connections with while they were in Taiwan. Everyone at the Abbey rejoiced: Ven. Losang is our first bhiksu, and Ven. Pende is our 11th bhiksuni. The Abbey is growing! Every Christmas, the Abbey community has the tradition of reading Shantideva’s Engaging in the Bodhisattvas’ Deeds out loud. Reading the entire book—ten chapters in all—at once is a moving contemplative exercise. Shantideva takes us through generating bodhicitta, to engaging in the bodhisattvas’ practices, and into the wisdom realizing emptiness. An inspiring dedication concludes the text. All of us were naturally silent after completing the recitation as we digested the meaning of the words and enriched our practice of bodhicitta and the bodhisattvas’ deeds. Over 30 guests made it to our last Sharing the Dharma Day of the year, coinciding with our celebration of Lama Tsongkhapa Day where we make light offerings to the founder of our lineage. Ven. Semkye gave a talk on the power of compassion in these turbulent times, drawing from The Book of Joy by His Holiness the Dalai Lama and Archbishop Desmond Tutu. You can watch Ven. Semkye’s talk here. Ven. Tsepal led a discussion on how compassion has impacted us personally during a candlelight vigil dedicated for victims of gun violence. We registered the vigil as one of the hundreds of events nationwide that commemorated the five-year mark of the Sandy Hook Elementary School shooting that killed 20 children and six adult staff. See photos here. Abbey nuns concluded another year of weekly teaching at the Unitarian Universalist Church of Spokane (UU) where they began to study Ven. Chodron’s book, Working with Anger. The UU group will continue to meet through the winter on Monday nights at 6:30 pm while Abbey residents are on retreat. Sessions will be student-led as the group explores The Book of Joy by His Holiness the Dalai the Lama and Archbishop Desmond Tutu. Write Susan for info. As the snow continues to fall, the construction crew is putting the finishing touches on the deck and exterior of Prajna Cottage. In the meantime, the interiors have been carpeted and partially furnished—the cozy cottage is almost ready for occupancy! We expect Venerable Chodron will be able to move in very soon. We are grateful to all our kind donors and the construction crew for building this new home (with running water!) for our Abbess. Check out the new video as Prajna Cottage Is Close to Completion. On Saturday evening December 16, Youth Emergency Services (Y.E.S.) 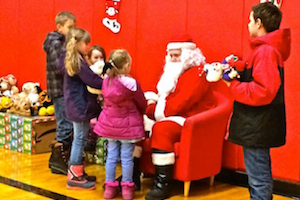 hosted a Christmas party at the Newport middle school for the homeless teens and families needing help in our rural Pend Oreille County. More than 100 family members and teens, as well as several Y.E.S. friends and supporters, attended this wonderful event. Vens. Semkye and Jampa represented the Abbey and enjoyed connecting with the children, teens, families and supporters. For several years, Ven. Chodron and Ven. Jigme have been board members at Y.E.S., and the Abbey cares deeply about these teens. After offering everyone delicious refreshments, each child, teen, and family received a Christmas present. The gifts were offered by more than 100 people in Pend Oreille County, Spokane, and other nearby towns. We are pleased that 30 gifts were offered by residents and friends of Sravasti Abbey. You should have seen how happy the families, children, and teens were! There were many smiling faces—moments of joy, gratitude, connection, and love. See the photos here. If you would like to know more, please see the Y.E.S. website. 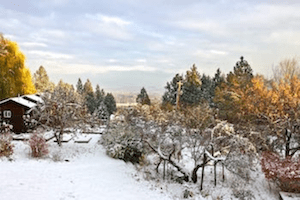 It’s time to sign up for the Retreat from Afar, which this year follows the Abbey’s Winter retreat practice of meditation on Amitabha, Buddha of Infinite Light and runs February 14 to March 30. Find out more about Retreat from Afar and listen to Ven. Chodron’s recent introduction to the practice, given in Singapore. You can also watch her video series of short teachings on the Amitabha practice. Additional preparation resources are here. On December 6, Ven. Jigme had knee replacement surgery. Her sister visited from Colorado to help for the first week, and now she is going to physical therapy several times a week. She is recovering well and has strong determination. Read about former President Obama’s recent meeting with H.H. the Dalai Lama and rejoice! Check out the full page interview of H.H. the Dalai Lama in the Times of India and another recent interview exploring more Dharma topics in the Times of India . Ven. Nyima shares her thoughts on The Book of Joy , a conversation between H.H. the Dalai Lama and Archbishop Desmond Tutu. Ken compares the Titanic voyage with crossing to the other shore, nirvana.